The Rouse Simmons was barely seaworthy and its captain a better businessman than sailor. That's why the three-masted ship, its crew and many of the Christmas trees it was carrying rests on the bottom of Lake Michigan. But the ship's demise in 1912, about nine miles northeast of Two Rivers, is helping to boost tourism here, draw attention to scores of other shipwrecks in the basin and could help designate part of the local underwater world a National Marine Sanctuary. Capt. Herman Schuenemann's fateful decision of 100 years ago appears to have an upside. 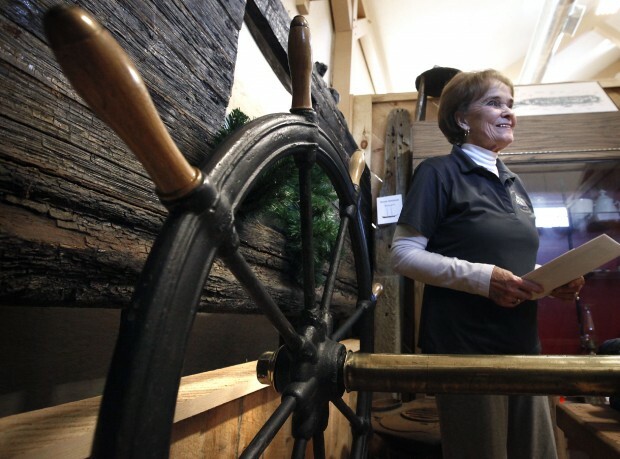 "This is just one of the stories of the Schooner Coast," Norma Bishop, executive director of the Wisconsin Maritime Museum, said of the Rouse. "This mid-lake region has the state's, and some of the Great Lake's, most incredible shipwrecks. This is about what are called submerged cultural resources." The Simmons, discovered in 1971, is just a fraction of the culture that moved goods up and down the Lake Michigan shoreline. It's estimated that more than 60 ships hauled Christmas trees at one time or another from 1868 to 1922. At least six of the schooners — the White Swan, Corona, Georgia, Melitta, Sea Gem and White Swan — were built in Manitowoc. Other products, such as lumber, railroad ties, shingles, coal and grains, also filled the hulls of ships. Some of them never made port but unknowingly and tragically laid a foundation for a modern-day industry.